A perfectly natural source of vitamin C from the acerola cherry. Certified 100% organic by the Soil Association. Can be stirred into juice or added to a smoothie. Includes the naturally-occurring synergistic bioflavanoids rutin and hesperidin. Approx 900mg vitamin C per teaspoon. Vitamin C contributes to normal function of the immune system and a reduction in tiredness and fatigue. 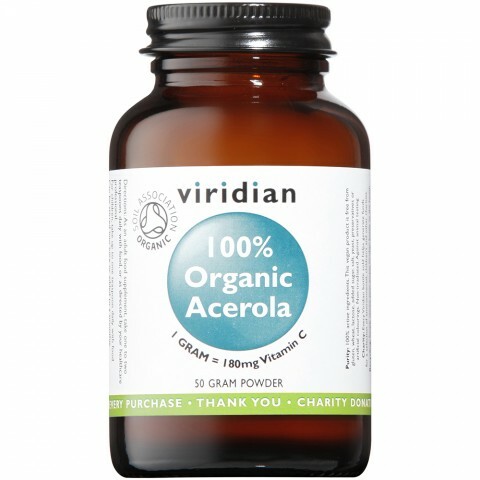 Certified organic acerola 1 gram, Providing natural Vitamin C at approx 18% 180mg. Directions: As an adult food supplement, take one to two teaspoons daily with food, or as directed by your healthcare professional.Ê For children, take up to one teaspoon daily with food. Can be stirred into juice or added to a smoothie.